Google reCAPTCHA is a program that judges whether a user is a human or a robot. You have probably seen some variation of reCAPTCHA. CAPTCHAs are used by many websites to prevent abuse from 'bots', or automated programs usually written to generate spam. Bots cannot easily submit forms protected by reCAPTCHA. Formidable Forms offers one-click reCAPTCHA (V2) and invisible reCAPTCHA. When setting up reCAPTCHA for your site's forms, you will choose between these two options. Create a free account for Google reCAPTCHA if you have not already done so. Register the site where you want to use reCAPTCHA. In the setup, please choose between reCAPTCHA V2 and Invisible reCAPTCHA. You will then receive a Site key and a Secret key for the site. Go to your site's Formidable → Global Settings. Insert your Site key and Secret key under the reCAPTCHA heading. Set the reCAPTCHA type to either 'Checkbox (V2)' or 'Invisible'. Only one type of reCAPTCHA is allowed per site. Set the default language for your reCAPTCHA. Add the reCAPTCHA field to each form you would like protected. If this is a multi-paged form, place the reCAPTCHA on the last page. When you insert a reCAPTCHA field into your form, you have the ability to use either a light theme (default) or a dark theme. You can adjust this in the Field Setting of the reCAPTCHA field. Please note: This setting does not apply to invisible reCAPTCHA. When you insert a reCAPTCHA field into your form, you have the ability to make the reCAPTCHA window appear its default size, or a compact size as shown below. This is particularly helpful if your form is in a small space! 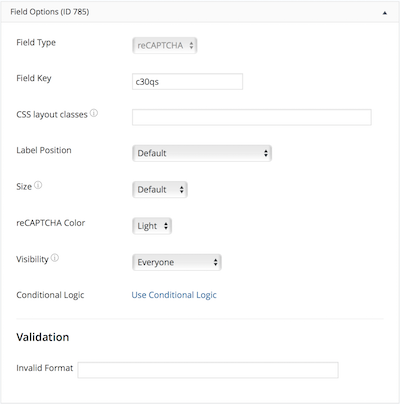 You can adjust this is the Field Options of your reCAPTCHA field. If your form includes a reCAPTCHA and you would like to turn it off, delete the reCAPTCHA field from the form builder page. Delete the reCAPTCHA field on any form that includes a reCAPTCHA that you would like to disable. You can also visit the Formidable -> Global settings page and remove the reCAPTCHA keys. 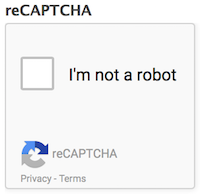 If you are using Invisible reCAPCHA on your site, and Google flags you as suspicious (most likely from submitting your form multiple times from the same IP address), it may display an image challenge after the submit button is clicked. This is expected behavior for Invisible reCAPTCHA to ensure you are a human, and not a robot. When the form is submitted, you may see the message "The reCAPTCHA was not entered correctly". Your site keys may not be correct. First, reenter the reCAPTCHA site keys and make sure there are no tabs or spaces in them. If your site uses SSL on some pages but not others, you may be getting a cross-site scripting error blocking the script. Try forcing the form pages to use SSL. If you have another plugin loading a reCAPTCHA on the same page, they are likely conflicting. Disable other reCAPTCHA plugins. If you are using reCAPTCHA on your site and you see the error 'ERROR for site owner: Invalid domain for site key', this means your site key is no longer valid. Please register a new key to resolve this issue. If you cannot resolve your issue, feel free to open a help desk ticket for further assistance. This error may be seen when another WordPress plugin is active that loads the reCaptcha in a different way, and included the script on every page. We've specifically seen this with the 'Pie Register' plugin. Learn how to find a conflict in WordPress to prevent the reCAPTCHA from failing. If you are working in a local environment, reCAPTCHA will work. However, it will show the message 'The reCAPTCHA is currently running on localhost'. This is normal behavior and the message will disappear when reCAPTCHA is used on a live site. When a page with a reCAPTCHA is loaded, you may see the error "Cannot contact reCAPTCHA. Check your connection and try again." One reason we have seen for this error, is the reCAPTCHA key is set to v2 but your forms are using invisible reCAPTCHA. Learn how to switch your keys to Invisible reCAPTCHA. We ave seen the reCAPTCHA fail in a certain browser. The cases we have seen ended up not being a browser issue, but related to page caching for logged out users. If the reCAPTCHA is working for you in one browser and not another, start by disabling any caching on your site.